Kristina Semenova (*1986) in Voronezh. Lives and works in Leipzig. She studied Dipl. German Philology in Voronezh, East European Studies at LMU Munich and currently is participant of postgraduate program Cultures of the Curatorial. Since 2012 she is working as curator of the residency LIA Leipzig International Art Programme, Spinnerei. In 2014 she has founded an art space Бükü- Bureau for Cultural Translations with Olga Vostretsova where cultural translation is tried as curatorial strategy. 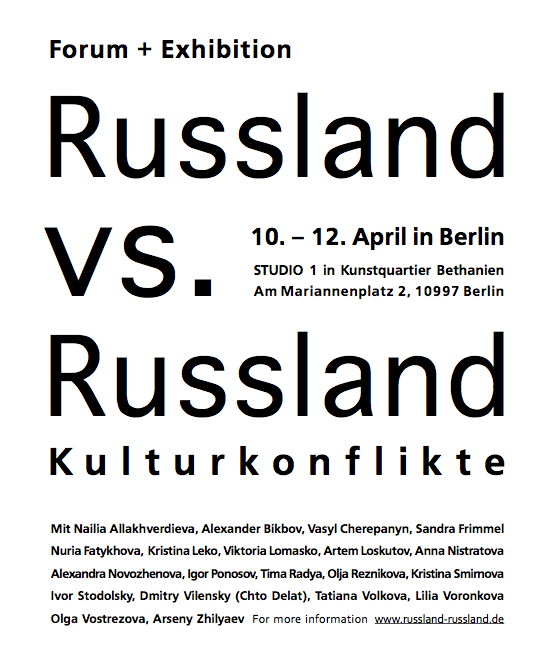 Curated exhibitions (selection): Spontaneous Frameworks (HGB Gallery, KV Art Association Leipzig, with Prof. Bara, 2015), Gender and Diplomacy – The »Ladies’ Programme« (HKW, with KdK participants), Fugure Outing (Machern, with New York Academy of Arts, 2014), Space LAB (cotton mill Spinnerei, 2013), Revisiting the Space (VCCA-Voronezh Center for Contemporary, 2012). She is member of Leipzig’s network of noncommercial art spaces Lindenow. Curatorial Residencies: GEOair (Tbilisi, 2014), ICSC-Intercity/Switchcity (POGON – Zagreb Center for Independent Culture and Youth, Zagreb, 2015).